For Amanda Grey, stopping the all-encompassing Apocalypse fated to plunge our entire existence into never-ending darkness . . . just kind of sucked. Sure, she had managed to capture every demon set loose on New York City. And yes, she ended up thwarting an evil angel’s plans to destroy humanity. But she also lost her sister, her apartment, and—oh yeah—Amanda Grey totally died and got her soul banished to hell as a result. AND THEN THERE WERE DRAGONS thrusts Amanda Grey into a whole new world of weird as she ventures out into the fiery wastelands, decrepit cities, and Olive Gardens of the afterlife in search of her sister and her own redemption. As the penultimate entry in the Shades of Hell Series, Amanda will be coming face-to-face with the truth behind the demon Shades, as well as a destiny she sure as hell didn't ask for. ABOUT THE AUTHOR: Alcy Leyva is a Bronx-born writer, teacher, and pizza enthusiast. He graduated from Hunter College with a B.A. in English (Creative Writing) and an MFA in Fiction from The New School. His personal essays, poetry, short fiction, book reviews, and film analysis have been published in Popmatters, The Rumpus, Entropy Mag, and Quiet Lunch Magazine. 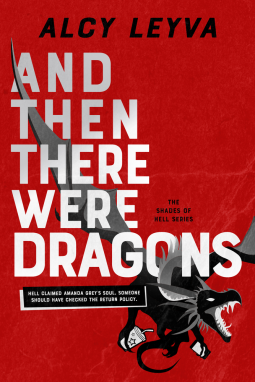 And Then There Were Dragons by Alcy Leyva, an interesting little novel. Amanda is having a bad day, she wakes up in a strange room, where she is told that she has died. She goes looking for her sister and when leaving she almost gets eaten. Things are not looking up.